In the Mid-Atlantic, the blossoming of the redbuds are as much of a signifier of spring as are the more beloved Japanese cherries. 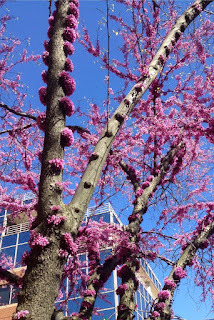 Redbuds are in some ways like licorice. Either you love them or hate them. Some consider their magenta-pink blooms to be a particularly odious color. It's true that this color is especially unattractive with the red brick homes that are a fixture around here. Like the cherries, older redbuds develop clusters of blooms on the trunk as well as the branches, making the tree look as if it is wearing a pompom-bedecked clown costume. Our ancestors valued the redbud for other reasons, adding the blossoms to salads or pickled relishes and using the inner bark to make a yellow dye. So whether you enjoy or dislike them, a redbud is capable of making itself useful.